Ragaa Eldin Ahmed, a young Egyptian tenor, is not a stranger to the local operatic scene. Over the past two years he has also started making a big impression on the international stage where he is received with well-deserved acclaim. Ragaa Eldin, as he presents himself to international audiences, appeared recently at Algeria’s International Festival of Classical Music, an event that for one week — between 12 and 19 September – brought together musicians and orchestras from all around the world. Ragaa Eldin opened the festival with a ‘three tenors’ concert that, beside him, also featured Yanis Benabdallah from Morocco and Hamadi Lagha from Tunisia. The Algeria’s National Symphony Orchestra was conducted by Amine Kouider. Algeria’s performance is only one of the several commitments that Ragaa Eldin has on his plate, which include leading roles in the operas of Italy and Paris. In Egypt, he took part in a performance featuring Al-Nour Wal Amal Chamber Orchestra, which took place on 30 September and is scheduled to travel to Paris in early November. As impressive as his busy artistic agenda seems to be today, Ragaa Eldin’s road to successes has not always been a bed of roses and rather it came as a result of his talents, eagerness to learn and boundless perseverance. Ragaa Eldin studied opera singing at the Cairo Conservatory with the professor Sobhi Bidair and obtained the Diploma in Music Performance from the Trinity College through their representative entity in Egypt. He started singing first at the Cairo Opera’s A Capella Choir followed by smaller solos in operatic performances and gala concerts. “I got very impressed with the international classical music life so I decided to find a way to further develop my skills outside Egypt,” Ragaa Eldin explains mentioning the first step he took, by enrolling, at his own expense, into master classes with soprano Caroline Dumas at the renowned l’Ecole Normale de Musique in Paris. “It didn’t take me long to realize that Paris is the place I wish to grow as a singer,” he explained, stressing that at the time he also realized that it would take a lot of effort to realize this dream. Ragaa Eldin continued in Egypt and in 2008 became an official member of the Cairo Opera Company. At this time he was also taking part, on a yearly basis, in the Finnish-Egyptian Musical Bridge in Cairo, an initiative by Ralf Gothoni, a Finnish pianist, conductor, and professor, who aims at creating strong links between Finnish music professors and young Egyptian musicians. Ragaa Eldin underlines that it was through the Bridge that he managed to take further courses in Finland. “I started discovering the many artistic aspects of opera singing, elements which I was not always aware of when studying in Egypt. The curriculum and the way it is approached internationally differs a lot from how the artistic education is implemented at the Cairo Conservatory,” Ragaa Eldin explains that a part of the development of the craft, one of the essential gains of this period was finding self-confidence as a performer. Ragaa Eldin’s dream to establish himself in Europe was growing stronger by the day, but what he lacked was financial means. Though Ragaa Eldin was accepted into Queen Sofía College of Music in Madrid, again, with the partial scholarship he was offered, he could not complete his studies. Upon return to Egypt, his hardships were topped by the beginning of the 2011 Revolution and Ragaa Eldin’s call to military service. Ragaa Eldin says that there is no legal clause indicating termination of a contract with the opera should an artist begin his military service. The young tenor resumed his activities two years later, in 2013, when he began performing at the Cairo Opera as guest artist. At the time when everything seemed to be going against him, the ray of light came through Ragaa Eldin’s personal connection. He got in contact with the CNIPAL opera studio in Marseille. This led to meeting Caroline Dumas again, who this time helped him receive a full scholarship from the French Government to study at the l’Ecole Normale de Musique in Paris. It is at this prestigious school that Ragaa Eldin received his diploma in opera singing and is currently enrolled at the higher stage of studies (Diplôme de Perfectionnement). 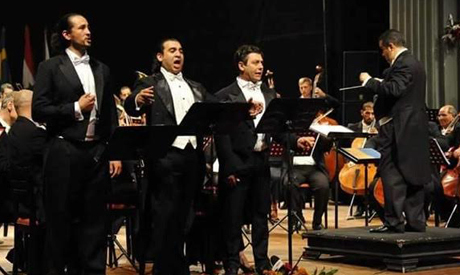 While realizing his dream to study abroad, the young tenor has launched his career outside Egypt, first participating in small concerts and quickly impressing international audiences with several main roles in well known operatic works. In 2014, Ragaa Eldin auditioned for the leading tenor role of Manrico in Tèatro Mancinelli Orvieto’s production of Il Trovatore — conducted by Maurizio Arena — where he was chosen from a large number of singers. He performed the same role in Egypt’s staging of Il Trovatore directed by Hisham El-Tally, an assignment that he says did not come without the opera giving the cold shoulder to the Egyptian tenor. Finally in May 2015, the Cairo Opera’s audience was offered the tenor’s warm, strong timbre and melodious phrasing with the famed high and clear C, a very difficult note to hold for a tenor, which comes in All’armi’ (To Arms) in the 3rd act’s cabaletta “Di quella pira” (Of that dark scaffold). 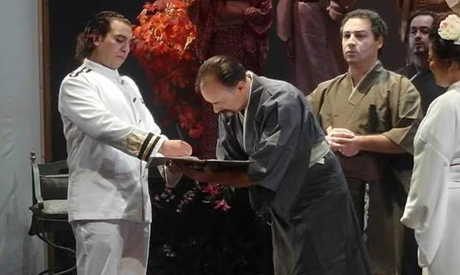 The Cairo’s performance came when Ragaa Eldin was asked to join the Tèatro Mancinelli in their next production, Puccini’s Madama Butterfly. He then performed in Péniche Opéra, in the leading role of Werther in Jules Massenet’s operatic adaptation of Goethe’s masterpiece The Sorrows of Young Werther. While it is apparent that Ragaa Eldin’s career is taking off, his schedule becomes increasingly booked. 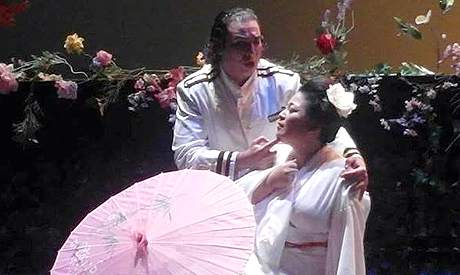 In the near future he will perform Madama Butterfly again, and join tours across stages in Turino and Bologna. While flourishing outside Egypt, Ragaa Eldin shares his impressions of both worlds and the big difference between the kinetics of operatic work in Egypt and internationally. “On the international scene, the artistic side of the production is very important. Not only voice, but also many other details are taken into consideration. The opera conductors are extremely selective and have a big say; they have the power to choose or change the soloists according to their artistic vision. This system is not practiced in Egypt,” he explains. Ragaa Eldin also points to the time and effort given to analysing the text itself during the preparatory work for the production. In this context, he mentions his role as Werther, describing how weeks of work and delving deep into the text helped him to adopt the character, allowing him to be immersed in the romantic hero’s pains. Ragaa Eldin speaks passionately about his experiences in the international scene, though his voice is tainted with sorrow each time he draws comparisons to the reality in Egypt. “Egypt has so many talented singers. Unfortunately, the complex dynamics that rule the opera scene and the Cairo Opera Company specifically do not allow many young talents to develop and shine. “It follows that many artists choose to grow and perform outside their home country,” Ragaa Eldin adds, marking the management as responsible for many departures of Egypt’s unique talents. He points to soprano Amira Selim, mezzo Gala El Hadidi, tenor Hany Dessouky, Georges Wanis, and Joseph (Joe) Kauzman as examples of those who chose to pursue their careers outside Egypt. “Take soprano Fatma Said as another example: she sung in a concert conducted by the renowned Juan Diego Flórez. Look at bass-baritone Ashraf Sewailam who today sings at the most important operatic stages, including New York’s Metropolitan. He sung Ramfis in the opera Aida thousands of times to large international acclaim. Why don’t we work to bring those great names to perform in Egypt?” the young tenor asks. Ragaa Eldin underlines that not only him but also all other singers would love to give back to Egypt, saying that, unfortunately, the repertoire of the Cairo’s opera scene is very limited, not to mention repetitive, and in many cases not suitable for the young singers. He points to the Opera Aida that was staged at the opening of the Suez Canal extension, to which none of the Egyptian talents who have proved themselves internationally were invited. 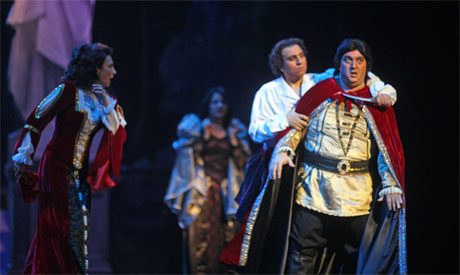 Instead, the opera invited an Italian tenor to join the Cairo-based singers. While Ragaa Eldin has established himself in France where he continues his education and performances, he is open to singing in Egypt should such an occasion and invitation come along. In the meantime, the Cairo audiences were able to attend his performance with Al Nour Wal Amal Chamber Orchestra on 30 September.